This Old Spanish farm hamlet has been restored and converted for comfortable living. 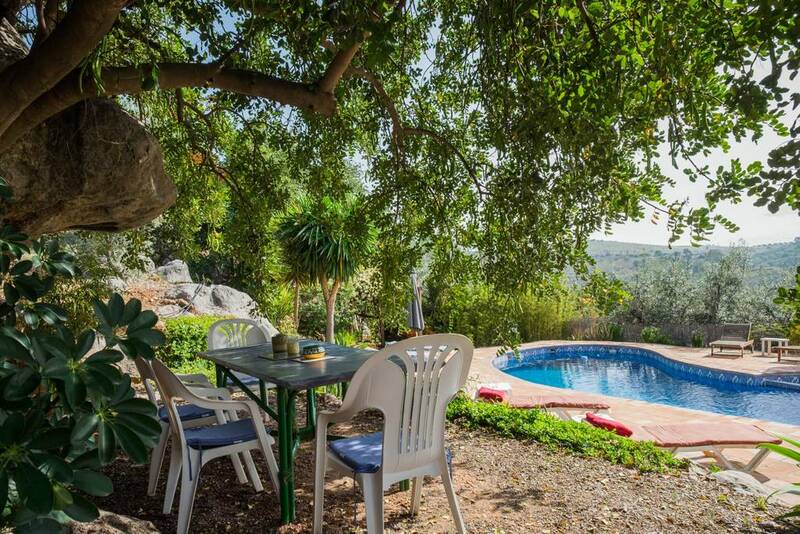 A rural self catering Andalusian farm house consisting of three adjoining properties to rent, a lagoon shaped swimming pool and wonderful gardens. Situated among olive groves with unspoiled views of the valleys and mountains beyond. The hamlet’s Axarquia location makes it perfect for a relaxing holiday yet with so much nearby for those of you that love to explore. One of the highlights at Cortijo La Calera is our stunning lagoon pool – very popular with our guests. It has internal lighting and a water feature. It has recently been completely re-tiled and now has marvellous lounge steps. It is 2.3 metres at the deep end. The pool terrace has soft lighting too – perfect for relaxing evenings outside. The temperature rarely gets too low for comfort. Take in the scents and colours of the gardens or go for a leisurely swim. All the windows in these well-appointed houses have stunning views. Experience endless natural delights in the Sierras always having the scent of the lavender, thyme and sage that edge any track you walk along, the fascinating bird life that changes with the seasons – and after a day out you can return to “La Calera” with its warmth and comfort. Relax on a lounger by the beautiful pool, sit in the sun or in the shade of the ancient carob trees. We have tried to think of everything,so come and discover for yourself, just what makes our Casa rural so special…..
Sleeps: 7 adults plus 3 children. We are absolutely in love with Steph and Terry’s place! Everything was perfect, so here’s our top 5 of our stay: 1. The house itself (VERY clean and has a lot of charm). 2. The pool. 3. The peace and quiet (great escape from the city!) 4. The location. The mountains and the views are just amazing! 5. Last but definitely not least: Steph and Terry, the cats and dogs, and also the other guests. We could not have enjoyed it more and we’ll definitely come back! Thank you both for your wonderful way of being. You are so thoughtful, kind, positive warm people. We have enjoyed every day of our 4 weeks here in your lovely paradise. It has been way more than we expected and ever dreamed of. Thank you for giving our daughter, Olivia, unforgettable experiences. We hope to come back soon. It was also nice that you had some of your regulars here who are also wonderful people. Thank you so much. We had a thoroughly enjoyable stay – despite the drenching – the whole area received the first two days. The sun came out – hoorah. A lovely relaxing time, lounging by the pool, walking up the hillside , beautiful views and sunrises and sunsets. Had a great day out in Comares, the nearby white village. Our first time in Spain and we will hopefully be back. This place is exactly what I wanted – peaceful and beautiful. Steph and Terry are perfect, relaxed hosts and very thoughtful to ensure your stay is comfortable. Thank you for everything! It’s an amazing place. Great hosts. Sad to be leaving. Perfect week away with our 3 month old baby. We’ve had an amazing time at Stephanie and Terry’s finca. The little casita was exactly – and maybe even better – than described or shown on pictures. We loved the fact that we had our privacy (two private terraces), but Stephanie and Terry are extremely open for contact. The communication before starting our trip was very pleasant and Stephanie was quick with answers and responses. During our stay we could easily reach out to our hosts if we needed anything – like help driving our little Panda up the drive way – or a guide to a specific restaurant or store. The surroundings of the finca, all the plants and flowers and the amazing pool made our stay complete. We would absolutely recommend this place and we hope to get back to this lovely place one day. Thank you so much dear Stephanie and Terry! We had a fantastic 5 days here, living in a little, breathtakingly beautiful bubble. Steph and Terry are incredibly welcoming and so helpful! We’ll definitely be returning! Terry and Stephanie were the most perfect, welcoming hospitable and friendly hosts. La Calera is stunning. The views, the accommodation, the pool, the gardens, all beautiful and set against the dramatic backdrop of La Peña de Hierro complete with resident eagles for you to spot from the pool. A stunning farmhouse and cottages they have renovated over the years and the love shows. All absolutely stunning, every inch paradise. The house was exceptionally well equipped and very clean with everything you can think you might need and more. We absolutely loved that the location whilst secluded is only 10 minutes away from shops and restaurants. Highly recommended. Would go back in a heartbeat. Agaves, Aloes, Olives, Bouganvillea (white, pink and coral), Jacaranda, Hibiscus, Bamboo, assorted succulents, Yukka, Birds of Paradise and Geranium strive for ascendancy around the deep-blue crescent shaped pool. But the Carob, with its drooping seedpods stands head and shoulders above the rest. Frangipane, Zebrina, Tradescantia and Jasmine dot the eyes and cross the t’s. The Carob appears welded to large chunks of rockslide – furtively covering a filled in cave that has secrets to tell of the Spanish Civil War. The immense sky above is impartial as Kestrels, Eagles, Bee-Eaters, Golden Orioles soar and flit hither and thither. Swallows and Swifts swoop gloriously and skim the pool for wasps, bees and blue or red translucent dragonflies. Apart from the usual sunbeds and parasols scattered around the pool there are two secluded sitting spots; one under the huge Carob, tinkling with wind chimes, and ours, the enchanting pergola nestled amongst Bamboo and assorted Bouganvillea. Behind the pool, as the ground ascends past the numerous Olives the view is enriched by Pena de Hierro (the rock of iron) which many, many years ago jettisoned large boulders onto the world below. I could mention the steep twisting drive up to the three rentals, the breathingtaking views and the elevated gardens. 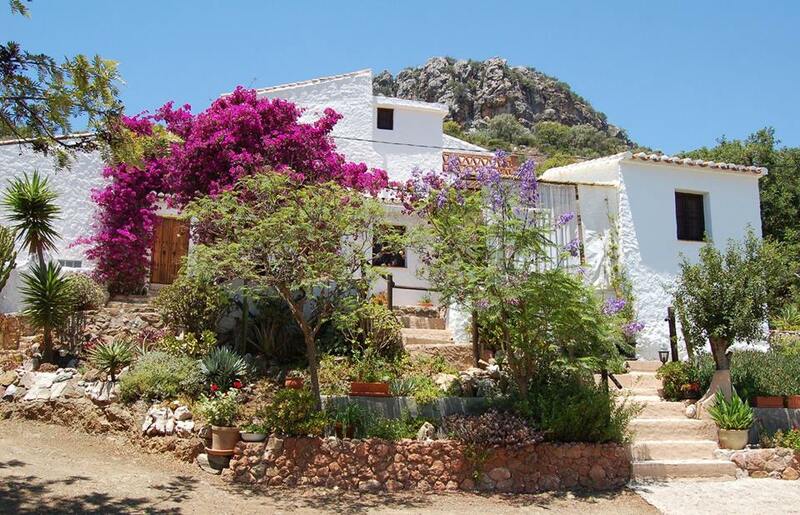 The delightful Casa Algarrobo, and the Casitas, Gorrion and Buho Real, but I won’t, I have said enough. Suffice to say La Calera is heaven on earth. Paradise. Many thanks Terry and Steph for making it so. La Calera is worth a visit! Here you can leave your soul and feel comfortable all round! Simply fantastic! The house, the pool, a beautiful garden, easy to reach super hosts! All in all 5 stars!! We had an incredible time during our stay at the cottage! Steph and Terry are very helpful in anything you might need and have several really good recommendations for restaurants and shopping. The cottage is very clean and everything one might need for cooking or a nice BBQ is provided. We can absolutely recommend a stay! The place of Steph and Terry is a wonderful place to relax and forget the everyday life. We were beyond impressed with every bit of this place: the view, the silence, the beautiful terraces around the house and the pool. The cottage was very cosy and perfectly equipped. Steph and Terry are amazing hosts and they give a lot of information about the area. Looking forward to come back soon. This was our most enjoyable stay in southern Spain so far! 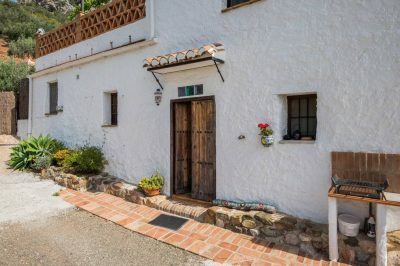 The country house “La Calera” is situated in the beautiful hinterland of Malaga, very comfortable by car, romantic calm and well connected to the world at the same time. The “Cortijo”, where formerly a large family with their animals lived, was elaborately and with love and handicraft skill restored. It offers full comfort to relax – you sleep well, sit well in the house and out on the terrace. The pool offers refreshment and lots of romantic corners to relax and read. In the house you have the complete accessories for cooking, baking and barbeque. We were a whole family and only cooked ourselves – perfect! The host couple from England, Stephanie and Terry, made us the holiday very pleasant. They are warm, explain a lot of the history and the present of the surroundings, you feel integrated. Great respect for their performance in the restoration, as well as for the professionalism and heart as they do the vacation rental, and their attentive accompaniment of the guests in everyday life. The surrounding area of La Calera is characterized by gentle green fertile hills. Olives and almond trees, citrus, avocados and mangos grow everywhere. On every piece of land something is cultivated. Walks are so much more interesting. Thank you for a wonderful holiday, and see you again. although each house had its own terrace so you have plenty of privacy. You need your own vehicle to get to restaurants or shops but there are a few minutes drive away or you can ask Steph to get some shopping for you in advance! Steph and Terry were very helpful all the way through with directions, suggestions or walking literature. I truly recommend this place if you look to explore “los pueblos blancos” of Malaga and staying in a quiet place only 20km away from the beach. We enjoyed everything about our stay in the mezzanine, which is small but very adequate for two. The collection of three places available for letting has been planned to provide each with its own secluded sitting space outdoors, as well as common use of the pool area. The rural setting is a delight, and the garden is beautifully planted up and well maintained. Well equipped kitchen and comfortable beds. The hosts could not be more helpful, considerate and informative. They have worked very hard to create a really good place to stay. We enjoyed a very relaxing and peaceful stay in the lovely and very tidy Casita Buho Real situated within beautiful surrounding gardens. Steph and Terry are very good hosts and always there to help. We can highly recommend La Calera, the apartment and the location and will be back soon. A fantastic place for a relaxing getaway! 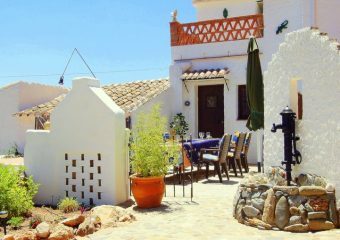 The apartment Casita Buho Real has a really nice authentic Spanish countryside vibe, very charming. Nice facilities with multiple terraces, barbecue & big inviting swimming pool. The view of the surrounding landscape is stunning. Steph and Terry are great hosts, very helpful. Highly recommendable! Steph and Terry are very nice hosts, helpful in every situation. We spent wonderful holidays in their lovely apartment. It’s perfect for everybody who loves to have a relaxing time. We had a lovely time in the charming apartment. Everything is here,nothing missing you may need. of the place.Everything is thought of to enable a real relaxing and tranquil time! Thank You! The house is a chocolate box of unexpected surprises,as though entering in a story book.Everything is cute and clean. The pool- well we needed it and loved it, spent hours in it! The scenery is fantastic and the cats and dogs contributed to the atmosphere of the house and it’s surroundings. Merci! Tack, Thank you, Muchas Gracias. Totally great week. 5 Happy boys and 6 very satisfied adults. It’s all been said …agree 100%. 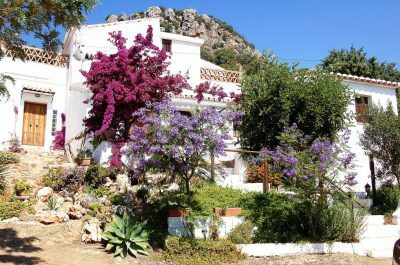 Wonderful Cortijo,everything catered for,fabulous pool which is enjoyed every day + beautiful countryside. Blue skies daily and such helpful and friendly hosts. Perfect. This lovely house made us feel at home right away. The views are spectacular and the quite and starry nights mesmerizing! Steph and Terry are really friendly and helpful, love you guy’s! In the middle of olive country with a dash of citrus, almonds and carob trees you can feast your eyes as well as your mouth. Granada and the Alhambra is only 90 min’s by car. The beach is a 30 min drive. All the sierra’s and peak’s in the area are perfect for hiking. And after that a quick dip in the pool! What a lovely place with a very welcoming couple. They are there when you have a question or just for a talk. Never to much to explain where to go, what to do etc. And they supply you with a lot of information . A nice welcome package is there when you arrive. The casita it self has an atmosphere that make you feel home, a good kitchen, a fine shower and a pleasant bedroom. But the terrace it the place to be. In the morning for sunrise and in the evening for the moon and stars. But also for just listening to nature. The surroundings are beautiful: there a less houses in this area, no noise, with a lot of nature around and daily live. And for me: the bench at the beginning of the 3 km long track to the house! I gives you lovely views, also on the walk to reach it. A wonderful place to spend time and to come back every day from a day out. There are many walks in quick reach by car, nice authentic villages, beach in 30 minutes and so much more. There are more rooms/houses to rent. But the all three have a very private space outside. Dear Steph and Terry, once again a BIG THANK YOU for the fantastic time we had at your little cosy cottage! You are by far THE hosts that managed to make us feel special from A to Z! From the first contact, over to the pre-arrival information, the warm welcome, the hand book and all the little details made it all so fantastic! The cottage is beautiful! It seems like you thought of EVERYTHING! There is really nothing missing! We felt home away from home while sitting on the terrace surrounded by pure nature enjoying our holidays We will be back! Stephanie and Terry are very good hosts, making you feel at home at their marvelous place. They share all the information you need, and really care about their guests. They provided us with a nice welcome package, which we happily consumed on the hot and sunny days. The house is a lovely place in a beautiful landscaped garden with pool. An excellent place for total relaxation. We had a great stay! The house was clean and cosy, we had a private terrace, really beautiful view and surroundings, great swimming pool and Stephanie and Terry were very helpful and friendly. I can definitely recommend it! Hope we will come back some day. Stephanie and Terry were great about facilitating our stay — their directions and map were key in getting us there! The place is quiet, secluded, and has an amazing view. We felt a million miles from home, which is what we were looking for! We really enjoyed relaxing by the lovely pool and exploring the small villages in the area. Very nice spot in lovely nature. We liked the calmness and peacefulness of the place and relaxed right away. 20 mins car drive to sandy beaches,50 min’s from Malaga and the airport. The stay gave us all that we wanted: city: touristic: shopping: beach: chill and countryside sensations from the pool and garden views. Thank you for a great stay. It was a marvellous time spending our holiday with Steph and Tierry. Really, the most beautiful place to stay. Everything is arranged and the responding is quick and secure if you need anything. The house is a dream to stay in and the views magnificent. I highly recommend this place!!! Wish I could stay longer. 2 weeks , gone so fast, lovely place. Steph and Terry are very kind and helpful. Our first time here but definitely not the last! Paradise !!! After driving through the country and visiting many beautiful places, we liked to come back here, so, so nice and romantic “Spanish farm” and the kindest of hosts. Thank you so much. We had a lovely time in this charming apartment. Everything is there, nothing missing that you need on the material level and to discover the surroundings. Terry and Steph are adorable and delighted to share their good plans! Stayed an extra two days. We want to return again to find the calm, and beauty of the place. Everything is thought of to have a real relaxing and tranquil time! Thank you!!!! I stayed at this lovely cottage for about 10 days on my own and had a marvelous time. To me a five star review is not enough to express how I liked this place. If possible I would have given 10 stars. I fell in love with this cute and cozy cottage that is carefully decorated with good taste and style (and not just filled up with loads of IKEA stuff). On my arrival Steph showed me around the house and there was fresh fruit, wine, yummie cookies and drinking water as a welcome. The cottage just has all you need. A good equipped kitchen, a nice and hot shower, a comfortable bed ( with amazing views..) and a cozy outside terrace ideal for having just breakfast or for just spent all day relaxing on the couch. For those chilly evenings there’s a huge fireplace to sit next to. All rooms were equipped with a heating system, and Steph even put an electric blanket on my bed because Andalusian winter nights can get quite cold. I think that is what I so much liked here, it’s all in those little details. Everything is being taken care of. For those working online: excellent wifi around the whole property! The hosts are just superfriendly and helpfull. Steph brought maps and a walking guide when she found out I love to make long walks. After having climbed la Maroma ( big hike up to 2026 meters) I found a tupperware with a freshly baked cake by Steph in it on my doorstep. I think carrot cake never tasted that good in my entire life! Around the house there’s a beautiful garden with lots of birds and special trees and flowers. And the view from the terrace is just beautiful every time of the day ( and night..). The house is located very convenient for day trips as well. It’s just a half hour drive to the coast, and also for exploring the mountains and villages more inwards it’s great. I think this cottage is perfect to stay in at all seasons. Again, I can highly highly recommend a stay at La Calera. The house is just bliss and so are the hosts. Don’t hesitate, just book! Copyright © 2018 Stephanie Mock. All rights reserved.